General Jeff, widely known as the West Coast Hip Hop artist, D.J. General Jeff, has been working hard on the streets of Skid Row in Los Angeles to help improve life and bring justice to homeless men, women and children. 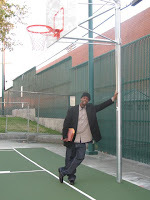 General Jeff and ISSUES AND SOLUTIONS helped to bring this brand new basketball court to Gladys Park in Skid Row, courtesy of NIKE, the Department of Recreation and Parks and the LA84 Foundation (a non-profit effort dedicated to the development of youth sport). General Jeff says the b-ball court is just the beginning. Soon, the community will have 8 new chess tables, 4 shade umbrellas, exercise equipment and an automated public toilet. While there's much to appreciate, General Jeff wants people of good will to remember that there's much to be considered where the homeless population is concerned. He is referring to random food and clothes drop-offs in Skid Row that ultimately just end up on the streets. This type of vigilance and disrespect is exactly why community leaders have been shouting for some form of "official" structure to feeding and helping the homeless. 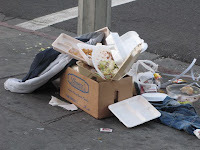 The blame for all this mess is then passed on to the Skid Row residents. For one, we did not bring these clothes and drop them on the sidewalk and there aren't enough trash cans for the homeless to properly dispose of trash. re giving a tour of Skid Row. 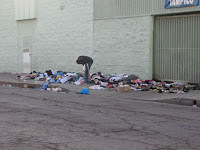 During the holidays, there are so many "drop-offs", that Skid Row always looks its filthiest. This happens every year about this time. Question: After the donors leave, who is responsible for all this trash? Hope your holiday season is better than ours.